The Krewe de Jeanne d’Arc selects three community leaders each year to portray three featured characters in our parade: a young Maid Joan, a King Charles VII, and a Queen Yolande. Maid of Honor Alyssa Fortier, a senior at Mount Carmel Academy, is president of the French National Honor Society where she initiated volunteer programs to connect Mount Carmel French students with local French immersion schools Ecole Bilingue and Lycée Français. “Joan inspires me because she is an example that young people can accomplish great things,” Fortier said. Fortier’s passion for the French language may be in her blood — she descends from a long line of French Creole ancestors, including the renowned French Creole language scholar and folk tale collector Alcée Fortier. Look for our young “Maid of Orleans”, Jeanne d’Arc, on horseback in a white robe with faux armor breastplate in the 11th annual Joan of Arc Parade. Midway through the parade, she will receive her sword after a blessing by the Very Reverend Phillip G. Landry at St. Louis Cathedral. This “student Joan of Arc” is selected via written application and recommendation letters; reviewed by a Krewe de Jeanne d’Arc committee. Finalists receive an interview in French and English by the Cultural Project Officer / Chargée de mission Culturelle of the Consulate General of France in New Orleans. The annual contest is open to all young women in the Greater New Orleans area ages 16-19 who have demonstrated outstanding community leadership and have French language experience and skills. Past Maids of Honor include: Martha Pinney (2018), Héloïse Trumel (2017), Margaux Schexnider (2016), Emma Martello (2015), Clara Bajeux (2014), Gretchen Neuenhaus (2013), Aggie Bell (2012), and Blair Davis (2010). The 2019 Queen Yolande of Aragon is portrayed by Elizabeth “Liz” M. Williams. Williams is the founder and president of the National Food & Beverage Foundation and the Southern Food & Beverage Museum. A graduate of Louisiana State University Law Center, she holds the rank of major in the U.S. Army having served as a Judge Advocate General. Williams practiced law in both Washington D. C. and Louisiana and much of her research and writing centers on legal and policy issues related to food and foodways. She co-authored The A-Z Encyclopedia of Food Controversies and the Law and is the author of New Orleans: A Food Biography, chosen as the 2018 title for One Book One New Orleans. Her most recent book, co-authored with Chris McMillian, is Lift Your Spirits. Through her roles at the University of New Orleans, Williams was instrumental in the establishment of the Ogden Museum of Southern Art and the D-Day Museum, now the National World War II Museum. 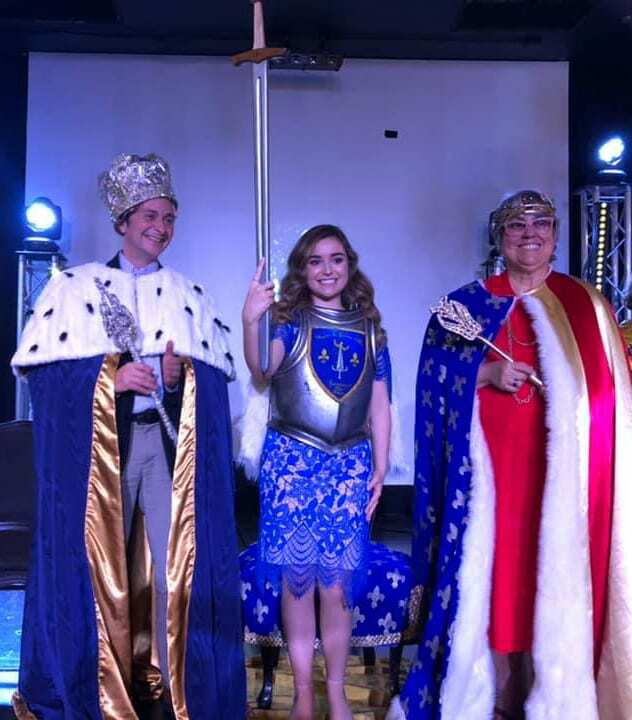 Queen Yolande will be riding in a royal “horse-drawn” pedicab, dressed in a cloak composed of the coat of arms and heraldic colors of the historical Queen Yolande. Past queens are Kristin Gisleson Palmer (2018), Camille Whitworth (2017), Sandra Dartus (2016), Simone Bruni Crouere (2015), Mary Beth Romig (2014), Betsie Gambel (2013). KING CHARLES VII: The “Dauphin” who became King due to Joan of Arc’s efforts is portrayed in 2019 by Alexandre Vialou. Also in a royal “horse-drawn” pedicab, he will wear a robe inspired by one of many paintings of the King’s coronation at Reims Cathedral, at which Joan of Arc was present. At the parade’s end, Mr. Vialou will be ceremoniously crowned by Ms. Fortier, Maid of Honor. The two will then cut the first king cake of the season, representing Joan of Arc’s birthday cake as well as Carnival season tradition. The public is welcome and encouraged to bring their own king cake to share and enjoy. Past kings include: Pierre-Loic Denichou (2018), Jean-Luc Albin (2017), Eric Belin (2016), Patrick van Hoorebeek (2015), Jacques Soulas (2014), René Bajeux (2013), Damien Regnard (2012), Lilian Cadet (2011) and David Villarubia (2010). Try to spot these and other characters in our parade!